Scenes such as this may be commonplace in the Central Valley by 2029. Photo: Wikipedia Commons. Monday evening the California High Speed Rail Authority, in conjunction with Caltrain, held a scoping meeting at the William J. Rutter Center at UCSF in Mission Bay. They answered public questions and took comment on plans to electrify Caltrain and bring high-speed trains from Bakersfield to San Francisco by 2029. 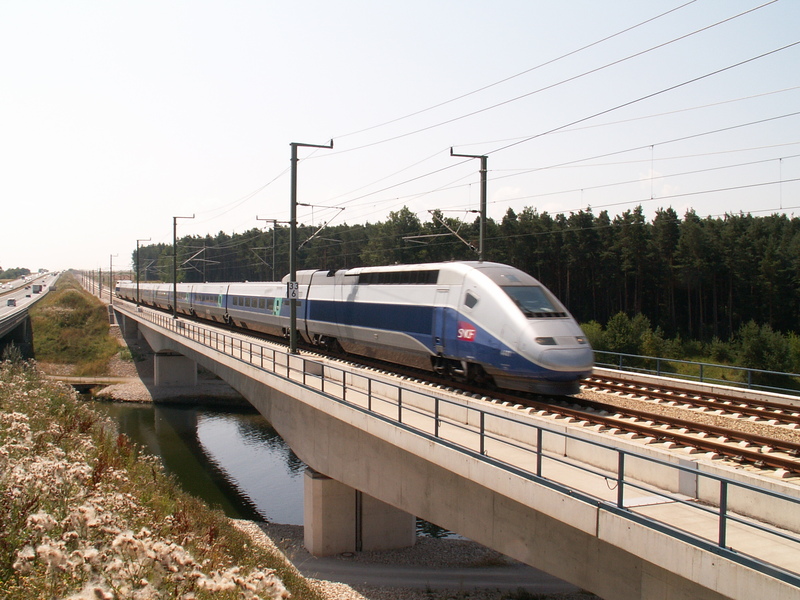 Streetsblog readers will recall that a few months ago the California-High Speed Rail Authority released a revised plan to link up Northern California to the Central Valley spine (which is already under construction). This meeting was one of a series to prepare the environmental reports for this next phase of construction. Casey Fromson explains Caltrain’s electrification project. Photo: Streetsblog. The meeting started at 5:30, with members of the public invited to visit local information stations to ask questions about the projects. Casey Fromson, a government affairs officer for the Caltrain Modernization Program, was at the Caltrain information station. 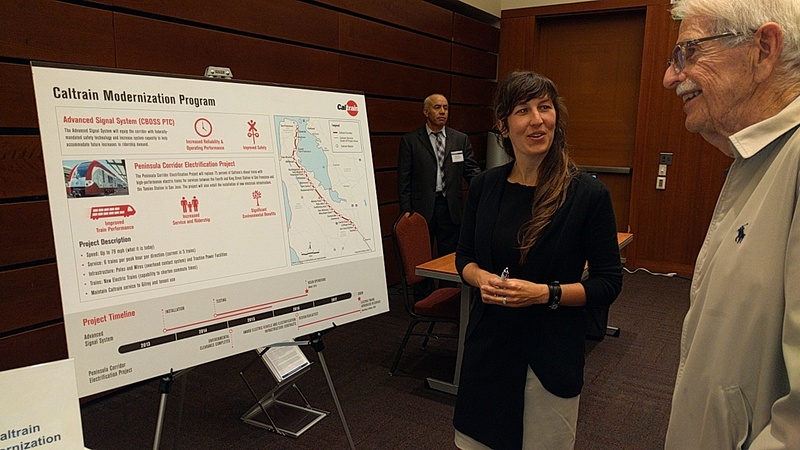 She explained that electrification of Caltrain, which, if all goes according to plan, should be completed in 2021, will offer faster service because of the better acceleration of electric trains. “A trip that our current, diesel baby bullets do in 60 minutes will take 45 with a train of electrics,” she explained. Still, it was disappointing to learn that Caltrain won’t be exploiting the top speed capabilities of its new electric fleet, which will start arriving in 2020. Although the trains will be capable of 110 mph, the tracks will only be able to handle about 80, because of the curves and the number of grade crossings. Getting the line up to full speed will have to wait for another round of improvements, such as adding more passing tracks, eliminating more grade crossings, and building more gradual curves, changes that will only come with the HSR project in 2029. Brian Stokle, with the group “Friends of the DTX,” [the “downtown extension” of Caltrain to the Transbay Terminal] was among the visitors. He expressed disappointment at the lack of progress in connecting Caltrain to Transbay, currently under constructions. “There’s no true political champion for it yet. And it’s a lot of money,” he said. That was a concern echoed by others at the meeting. Under current plans, it seems unclear when trains will reach Transbay. Image: by steelblue for Pelli Clarke Pelli. In 2008, the voters passed Proposition 1A, which paved the way for developing HSR service. We’re now at a point where we’re looking to move forward with the first revenue service. I’m happy to say it’s coming to Northern California. That was facilitated by the 2016 business plan which was released earlier this year and approved by the HSR board. 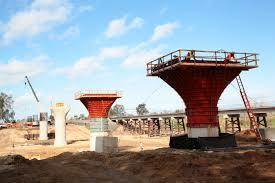 It laid out a road map for completing service to the Bay Area. What makes the 2016 business plan different from 2012 or 2014 is it…lays out how we can construct revenue service with the $20.7 billion we already have. It will run from downtown San Francisco to downtown Bakersfield. We’ve been looking at examples around the world. We want global travelers arriving to SFO to immediately be able to get onto the HSR service and get to destinations throughout California. Part of the challenge is to take advantage of the inter-modal connectivity: BART, Caltrain and freeway access. How do we integrate all that? 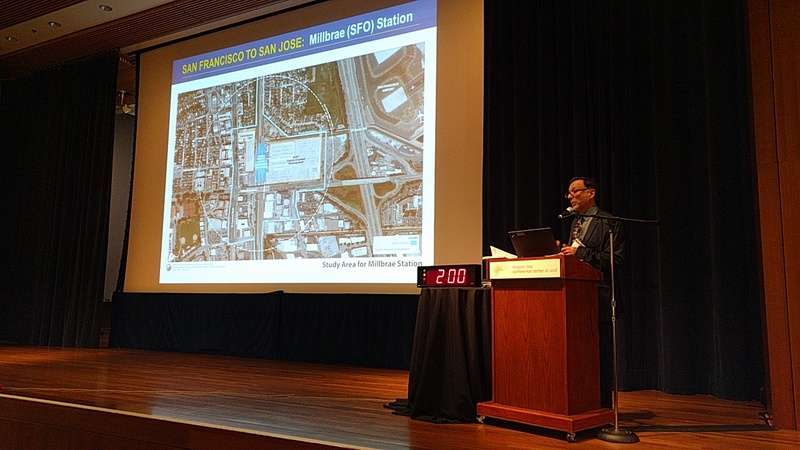 We’re trying to work with the City of Millbrae on their Transit Oriented Development plans. He also spoke about plans to integrate HSR at 4th and King and to help re-arrange Townsend so that bicycle, car-hailing, and bus service access to the station is improved. And that returned the conversation to the concerns of Stokle and others about the lack of progress on the DTX project. 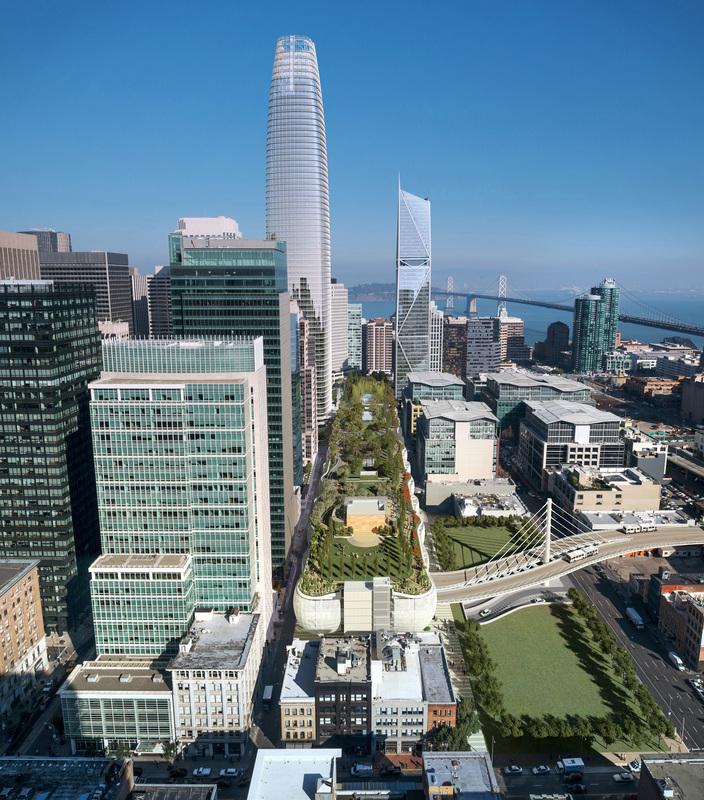 It was as if the HSR planners are already assuming the Transbay connection would not be completed in time–and that they would have to depend on King Street Station as its access point to San Francisco. There is an additional scoping meeting tonight, Tuesday, in San Mateo at the Marriott, from 5 to 8 p.m. at 1770 S. Amphlett Blvd., San Mateo, and another on Wednesday in Mountain View, at the SFV Lodge, also from 5 to 8 p.m., at 361 Villa St., Mountain View. One thing I know for sure is that nobody arriving at SFO will ever be able to immediately get onto the HSR service. Because of America’s finest transportation professionals, when those people arrive at SFO and want to actually get to HSR they’re in for an airport peoplemover ride, followed by a BART ride to finally get there. As taxpayers, we also get to pay for rebuilding the Millbrae BART monstrosity to accommodate HSR as room for the required tracks apparently wasn’t considered. Yep. Now that San Bruno is the “official” BART transfer station most times, without a direct Caltrain transfer, it gets more and more ridiculous. The proposed HSR plan makes getting from SF to Sacto longer than driving as it has to run south and over to Merced and back up the Central Valley. Oakland doesn’t get a station. Fortunately, when all is said and done I will be happily living out of state. HSR should run from SJ to OAK and under the bay to SF with additional spurs from SF and SJ to Sacto. I agree. But wasn’t there a problem with running the route though “lower income” areas (i.e. the East Bay) by virtue of CEQA? I recall someone here saying that, which totally stunned me. Instead HSR has to be routed through the affluent communities of the Peninsula. In other words, the “lower income folks” (and we all know what that really means) don’t get a decent train service because we don’t want to subject them to environmental factors. And won’t these trains be electric anyway? Meaning zero pollution? The idea is thus; (A) CHSR comes up the 101 and jointly funds and builds the San Jose tunnel with BAR/VTA.The partnership can involve bonds from multiple agencies owed to one another(Tunnel arbitrage) One agency might owe more or own more than the others (B) Caltrain is also a partner in the funding and borrowing for the tunnels.The end product would look like MUNI/Bart in downtown SF. (C) An ESOP would own a for profit entity that would fund & own/lease the CHSR stock and track and jointly own Caltrain track and stock.A minority of both systems would be managed/owned by CHSR and Caltrans.The ESOP is a leveraged one that borrows to build the system( it owns/owes the high speed rail bonds) and retired bonds become equity to the ESOP.Caltrans and high speed rail would in reality be under a common ownership. I’m trying to figure out the use case for SFO to HSR. If you’re going to SF, you’d just take BART. If you are going to San Jose, you’d … fly into San Jose…. This is silly. They didn’t tear down the tracks from SFO to Millbrae, they aren’t using them because the ridership didn’t dictate using that connection. If and when HSR takes off, we can run trains there. Since when was the important link for HSR the all important SF to Sacramento route? The two main population and business centers in California are SF and Los Angeles. Period. Any airline or flight which doesn’t fly out of SJC is a candidate for rides coming up from the South Bay or Central Valley. There is an extra transfer though for anyone arriving in Millbrae to BART and then to the airport peoplemover to the terminal to the plane. I’ve always wondered about converting/adapting the BART right of way between Millbrae and SFO into the airport peoplemover. There would still be BART to both SFO and Millbrae, the link between them would get taken over by the peoplemover. That seems like it could also make use of Millbrae as airport parking and a car rental hub (there are small rental lots closer to Millbrae than SFO already) and could alleviate pressure on parking/pickup car congestion at the airport proper. SFO flies 50 million people a year on over 400,000 aircraft movements. Internationally it serves 40 different cities on 34 different airlines. SJC flies about 10 million people a year on 130,000 aircraft movements, and has only a handful of international destinations. It is constrained for further expansion due to its proximity to the city center. Flying to and from SJC isn’t an option for most fliers, and that will not change. Ever tried to fly from Fresno or Bakersfield to any destination outside of California? Flights from those cities to any hub are infrequent and expensive, and most people end up driving to SFO or LAX instead. HSR will be able to codeshare with the airlines so passengers from the Central Valley cities can use the train for the first leg of their journey. It would be cheaper to automate a BART shuttle train between SFO and Millbrae so that it could run every few minutes, all day every day. Still requires a transfer if you’re not flying international but much better than the current situation. Ticketing could be integrated so that your HSR ticket from SFO opens the BART gates at SFO and lets you exit at Millbrae, with the transfer included in the price of the ticket. Organization before electronics before concrete and all that. Wrong, as usual. SJ has a bigger population than SF, in case you haven’t checked the Census in the past 15 years. If you actually took a minute to read my comment you’d understand that the SF-Sacto line would be a spur. If you’re spending upwards of $80B on a huge infrastructure project do it right and factor in population projections in areas outside of SF and LA. It’s all political, of course. Also, it’s not like there would be many stations along the East Bay route between SJ and OAK. Maybe one or two. The SFO BART station should never have been built. BART should have run directly from San Bruno to Millbrae with a people mover connecting Millbrae to SFO. Yes, and San Diego is bigger too – San Francisco is only the 4th biggest city in the state. Sacramento is smaller but, as the capital, punches above its weight. A real HSR would connect all five major CA cities, and their airports, to discourage flights of a few hundred miles, which are the most polluting and congestive. If you draw a circle around the center of SF that encompasses the size of San Jose – it would include more people. Just because there is an arbitrary border between SF and Daly City, but San Jose annexed everything doesn’t make San Jose more important. Why on earth is Millbrae a more important destination for BART than SFO? Still requires a transfer if you’re not flying international but much better than the current situation. The population wtihin the city limits of San Diego and San Jose is bigger than SF, of course (and murph knows that), but that’s a pretty poor measure a region’s population or economic importance. By the same logic, Atlanta is less important than Fresno. True, but the discussion here was about exactly where in the Bay Area the HSR should serve. If you wanted to serve the geographic and population center of gravity of the Bay Area, you’d probably run it to Oakland, and then connect it to BART. If you wanted to serve the most economically important part of the Bay Area, you’d probably run it to San Jose and Silicon Valley, and let it connect to an electrified CalTrain for destinations further North. And if the idea is to reduce flights of less than 500 miles, you’d prioritize connecting HSR to the airports. Fly to Amsterdam, Zurich, Frankfurt or Paris, and you can catch a HST directly from the airport terminal to anywhere in the country. That’s how to really do it. I agree SFO is important, but don’t knock Millbrae either. Caltrain interchange. Southernmost station (on the west side). Parking availability. It’s an important station for commuters. My biggest problem are the 20 minute headways you get on BART to SFO and Millbrae on the weekends. The Millbrae/Caltrain connection is important because they didn’t connect Caltrain and BART at San Bruno, run it to SFO, and been done with it. Parking availability for commuters is an argument I don’t buy – the three peninsula stations are still underutilized for parking – Millbrae allocates an entire floor of the parking garage for long term parking for SFO, there are allotments at SSF and San Bruno as well. murph also knows not to respond to any drivel from the commenter you are responding to, unless you like chasing your tail. Ah but had they done that, it would have been the end of BART’s decades-long ambition to ring the bay, no matter whether people want it or it makes sense or not. Millbrae is a suitable stub terminal, and they could eventually push further south from there. Ending BART at SFO would have made it far more difficult to extend it further south out of SFO later. Plus, San Mateo County was paying for it. I suspect they wanted to get to Millbrae to better claim they were serving more of the county, the better to convince everyone in San Mateo not remotely close to BART not to oppose it. You know Murph, if you wanted to let our readers know that you do not have any adequate counter-arguments to what me, Mark, Flatlander and others here are saying, then you probably could not do a better or clearer job of telegraphing that than to post an off-topic personal attack on us. Do people not want a more expanded BART service? Even ringing the Bay if possible? Seems to me the biggest problem is actually getting infrastructure approved, funded and built. Given that the alternative is often nothing, with the Federal And State money going elsewhere, there is a tendency to build it if support can be garnered. Regarding Milbrae, I think there was the perception that there were economic benefits to Millbrae and the surrounding areas to extend BART there. Whether that panned out, at least so far, is another matter. I totally agree, the Millbrae-to-SFO BART tracks should be converted to AirTrain. In fact, if this is done, the SFO BART station could be shut down and the San Bruno-to-SFO tracks closed. All Peninsula trains would go to Millbrae. As it stands, most SFO travelers are domestic, so from the SFO BART station at the international terminal you still need to get on AirTrain anyway to get to a domestic terminal. Once this is done we would have more frequent service to Millbrae, with trains every 7 minutes instead of every 15 minutes. This would make getting to SFO actually easier and more frequent for people in the East Bay! In addition, we would have a much better connection between SFO and Caltrain/HSR. Also we would have more possibilities of timed transfers between BART and Caltrain/HSR which would help people in the East Bay get to jobs in Silicon Valley. No you don’t. All three domestic terminals are fairly close and easily walkable via underground passageways in ten minutes or less, assuming your bags are wheelies. The only real reason to take the AirTrain is to get to the off-site car rental facility – something that Vegas, LAX and other major airports easily manage with shuttle buses. I doubt the original BART-to-SFO project would ever have been approved if it involved a change several miles away. Undoing that is not a viable option.